When you think of prepackaged cake icing, you usually think of canned buttercream-style frostings that are ready to spread onto a cake. There are also several frosting mixes out there to choose from, dried powders to which you add your own liquid ingredients – such as butter or water – and reconstitute when you need them. Boxed frosting mixes take up a lot less shelf space than their canned counterparts and often have longer shelf lives, which makes them handy to keep on hand for a cake frosting emergency (or anytime you want to save a little time). 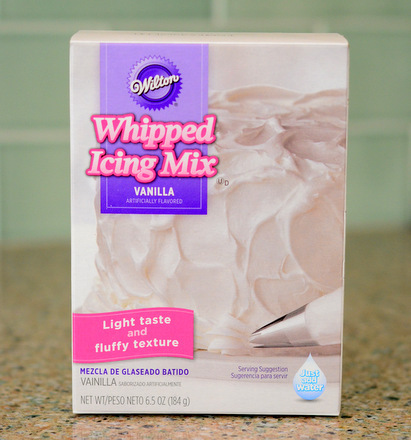 Wilton’s Whipped Icing Mix is a boxed frosting mix that you only add one ingredient to in order to whip it up. That ingredient is ice water. Once the water is added, you simply whip the frosting using a hand mixer or stand mixer (or your arm, if you’re up for the challenge) until the mixture comes together and triples in volume. The result is a fluffy frosting that falls somewhere between marshmallow and Cool Whip, a similarity that is hard to miss given the fact that the frosting is quite cool, thanks to the ice water than went into it. 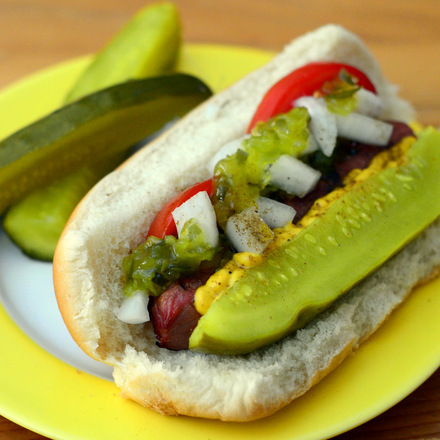 It is sweet, yet light, and it is incredibly easy to work with. It spreads onto a cooled cake very easily and can be neatly piped through just about any pastry tip. The frosting holds its shape and is smooth enough that your hand won’t get tired of squeezing the piping bag as you work. I really like working with this frosting and enjoy the cool, lightly sweetened flavor of it. I do find it benefits from a splash of vanilla extract, as it is a bit plain on its own. I find that this style of frosting is ideal for things like ice cream cake, where a traditional frosting might become brittle and crack, and that is what I use it for. That said, I’ve also used it as a quick, light alternative for cupcakes, where it is a fluffy complement to a tender cake. i love this frosting, it dyes very smoothly too.